Speculation about the identity of this year's headliners has been rife for the past few months, with Coldplay, U2 and the Rolling Stones the acts most often mentioned. According to the Sun, Chris Martin and co have now put pen to paper on a contract to take the Saturday night slot on the Pyramid Stage. They last played the Somerset festival in 2005, since when they have released a fourth smash hit album, Viva la Vida. Festival organiser Michael Eavis has made no secret of his desire to persuade the Rolling Stones to appear at Glastonbury, but the veteran rockers have turned down another lucrative offer. 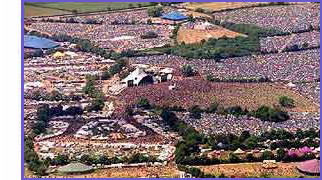 A festival insider said: 'Getting the Stones to Glastonbury has been high on Michael Eavis's list of priorities for a long time. He came really, really close this time round. Any Coldplay fans who didn't anticipate them securing the headline slot are unlikely to be able to see the performance in person. Tickets for the festival are already sold out, although organisers expect some to be returned closer to its start date of June 22nd.